What’s different about the Rodgers Artist Series is that everything will inspire you: the sound, voicing, tonal flexibility, build quality and the plain fun of playing. Developed with Rodgers’ new Natural Pipe Realism™ technology, the sound of Infinity Series organs is simply glorious. The specification spans various tonal genres, providing extraordinary musical expressiveness and versatility. Rodgers’ unique sampling process with up to 8 microphones captures the most detailed, authentic pipe organ sounds ever. With state-of-the-art Dimensional Sound Placement technology, the distribution of the sound creates an unprecedented level of realism. The Infinity Series, based on Roland’s powerful SSC technology, delivers the most authentic pipe organ sound available in a digital organ. 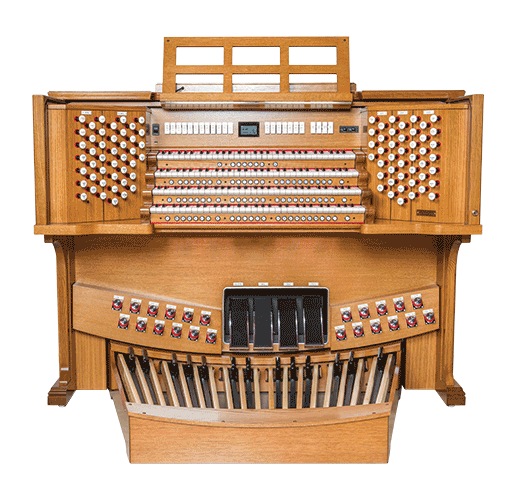 Rodgers’ long-standing leadership in instantly available organ flexibility has now been expanded with Library Access™ controls. Library Access allows the addition of any selection from the built-in Sound Library featuring 121 organ stops and 59 premium orchestral voices. Each selection can be user-voiced for volume, octave shift, tuning, warmness, presence, and brilliance, then saved to a piston for instant recall. The Model 484 has two Library Access controls each for the Swell, Great, Choir and Pedal divisions and one for the Solo division. Only Rodgers Infinity organs offer built-in support for AirTurn™ hands-free page turning using a mobile device right from the console. Store sheet music on your mobile device, then turn the pages using programmable thumb or toe pistons while you keep both hands on the keyboards. Your mobile device battery will never run down thanks to the high-power USB port located on the right end of the music desk – it’s always available to keep your device charged, and it’s capable of starting up an iPad even if its battery has been completely drained. In addition, Infinity organs are compatible with Rodgers Remote, a free app for the iPhone that permits you to remotely play back your own recorded music or songs from the Hymn Player, including the ability to change the volume, tempo and key (Rodgers Remote is scheduled for release in September 2014). The Infinity Series premieres elegant new console designs finely crafted from top-quality rift-sawn hardwood veneers in dark, medium and light oak standard finishes or optional custom finishes. Classic square, traditional plain and elegant cathedral side trim are available. Every Infinity Series organ comes with a glass-top lattice music desk that adjusts in four directions, an adjustable bench with music storage compartment, a central LCD menu screen, premium console trim, and a locking rolltop. LED lighted drawknobs come standard, with optional mechanical action controls. PerformanceTouch keyboards with Ivory Feel surfaces are a Rodgers exclusive feature, with optional tracker-touch available. They’re velocity-sensitive to allow delicate control of MIDI orchestral voices. Optional velocity-sensitive wood keyboards are available in a variety of key surface coverings, manufactured by Ulrich Hermann Tastaturbau in Germany. Rodgers’ distinctive self-contained 32-note concave, radiating pedalboard automatically calibrates precise firing and release points. The pedal keys are also velocity-sensitive, ideal for orchestral voices such as Timpani. Optional parallel pedalboard available. • Headphone jack included for silent practice. Console dimensions: Height 1363.2 mm (53.67”); width 1806 mm (71.1”); depth with pedalboard 1357.1 mm (53.43”). Weight: 484MV 312 kg (688 lbs); 484LT 293 kg (647 lbs).